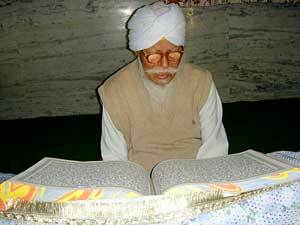 On 3 June, a series of Akhand Paths (24 hours a day readings of the entire Guru Granth Sahib) began early in the morning, and will continue non-stop until 24 December, the anniversary of Baba Virsa Singh’s passing. Devotees from near and far—Sikhs, Hindus, Muslims, and Christians—shared prayers for the foundation of a memorial place for their beloved Baba Virsa Singh at the site of his Samadhi in Gobind Sadan. 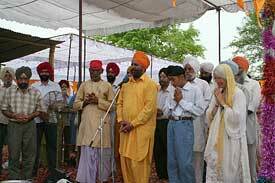 Hardip Singh led the assembly in communal prayer. To lend Gobind Sadan’s interfaith trademark, the ardas was followed by Pandit Anand Lal Mishra offering prayers and puja according to Hindu tradition, Gobind Sadan’s Imam Jabar Ali recited verses from the Holy Qur’an, and Russian sevadar Ludmila Borodina said Jesus’ Prayer in Russian. Seven sevadars joined in placing offerings and setting bricks in the hole for the first of the pillars. 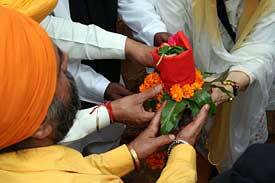 The ceremony concluded with a traditional Havan. Many devotees have expressed their eagerness to participate in seva for the memorial, which is being built in the field below Maharaj ji’s house. The inspiring 7-sided structure will be constructed around and over the temporary Samadhi structure, and will be surrounded by fountains.